Pro comics writer Brandon Seifert has a LOT going on in the coming weeks, including his new digital-exclusive comic Spirit of the Law from MonkeyBrain Comics, more Witch Doctor from Image/Skybound, and Hellraiser from BOOM Studios! Brandon is a Comics Experience Creators Workshop pro member, where he also offers an "Ask Brandon Seifert" thread, answering questions from members on the industry, his projects, and his creative process. Brandon's Spirit of the Law #1 (of 2) is now out through MonkeyBrain Comics, exclusively for sale through comiXology. It's 12 pages of story for only $0.99 -- and if you buy it in the month of November, MonkeyBrain is donating their share of the proceeds to the Hero Initiative. "It's the Great Depression, and Sammy Workman is lucky to have a job -- even as a mob hitman! But when a hit goes wrong, Workman and his men find themselves stalked -- by the paranormal vigilante they've accidentally created! You've seen plenty of superhero origins -- now, see one from the villains' point of view!" 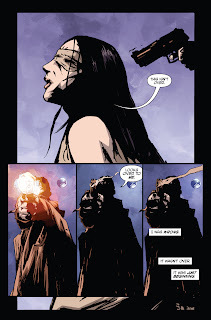 Grab Part One of this new two-part noir/pulp mashup from Brandon and Michael Montenat, artist of Hellraiser and Pilot Season: Anonymous. 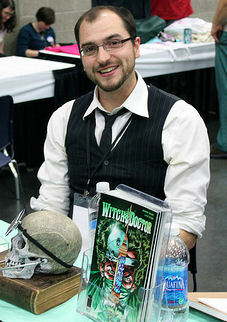 Witch Doctor was Brandon's initial break-out hit, and was the first title published by Robert Kirkman's Skybound Entertainment, an imprint of Image Comics. Witch Doctor is a medical horror comic written by Brandon and illustrated by Lukas Ketner, that has been called "House M.D. meets Fringe." In the book, Vincent Morrow, excommunicated from the medical community, serves the world with both hands -- one in magic, one in medicine -- as earth's Sorcerer General. Witch Doctor is both a sales and a critical success for Skybound, with positive coverage from IGN, Fangoria, io9, The AV Club, and many more. Writer Warren Ellis called the book "Mental." We look forward to seeing all of Brandon's work in the coming weeks! Just came across your blog through a site and found it interesting and informative, will definitely keep visiting for more. Like you to buy either a fair trade chocolate or a direct trade chocolate, Romano says. Like you to buy something where you, as a consumer, can vote responsibly for better treatment of these farmers. And also with fair trade, you know that they going to be at least on the road to being paid a decent wage. Grieves with you and our hearts break cute t shirts for you. God bless you. We will never forget your loss, Trump cool t shirts for men said. Answer 2, Additional Input Not necessarily. In an agricultural technique called hydroponics, there is no soil at all, but the nutrients are provided in liquid form to the root systems. There is also a new system, referred to as "airponics" where the nutrient solution is misted onto the roots of plants at frequent intervals, then vacuumed away.